When you're under 40, buying a life insurance policy may seem about as practical as buying a Humvee, and "financial planning" often means making sure next month's rent is covered. A vast number of young adults are facing an uncertain financial future. So, instead of making a case for something people don't want, MassMutual set out to make a difference. Together we created a sort of master's program for adulthood, where the curriculum covers everything from investing in a 401K to having that hard talk about a budget to how to pick good, cheap wine. We called it Society of Grownups. The team helped build the new venture with MassMutual from the ground up—designing a brand identity, a digital platform with some of the most sophisticated financial planning tools in the industry, and a hip brick-and-mortar locale. We thought everything through, right down to custom tables and pencils. And in the end, everything added up to a common vision. The new Society of Grownups staff is building on that vision, innovating and growing every day. Why "Society of Grownups?" Because we're all here to help each other become a little smarter. And a little more grown-up. Society of Grownups is not simply a design solution, but the beginning of a solution to a much larger cultural problem. The name "Society of Grownups" raises eyebrows, which is part of why the team liked it—it's provocative and intriguing. MassMutual could have rejected it in favor of something more corporate, but they didn't; they had the foresight to realize that it's more than just a name, it's a mindset. And it has the potential to inspire a movement. After fanning out to eight cities, from Boston to Kansas City to Los Angeles, with the aim of pumping a demographic of financially sophisticated young adults for insights that would help us sell them life insurance, the team realized we had made a fundamental mistake: the young adults we met were struggling with debt or attempting to save without really understanding the basics of financial planning. Despite knowing that they should save for the future, they balked at doing so at the expense of present-day happiness. Through design research, the team learned that this generation feels paralyzed by their financial illiteracy. Many young adults in their 20s and 30s feel that there's no resource reliable, accessible, or unbiased enough to meet their needs. We eventually realized that the target wasn't just millennials—these issues face people even well into their 30s and 40s. Instead of targeting an age range, we needed to target what we called a grownup mindset, and establish a relationship of trust. Only then could we begin to build a base of knowledge that would prepare these consumers to make choices about financial services. When the team realized our financially-secure-yet-uninsured young target customer didn't actually exist, we wanted to find out why. Our research showed that you either have a smart-money mindset or you don't—people don't learn to be better money managers gradually, over time. We realized that we couldn't expect our audience to rise to a level of financial sophistication on their own. Someone would have to help them. Why not us? The team worked with MassMutual for two years, during which the project evolved into a full-scale cultural intervention. We were working with a huge population that had become profoundly disengaged from financial services, and we needed to reconnect them in a way they could trust. It was a matter of designing for an unmet need—providing resources for many facets of grownup life, with personal finance at the core—and that wasn't about any single solution, but an entire system of tools, services, and creative tactics. We helped MassMutual build the new venture from the ground up, conceptualizing the idea, designing a brand and identity, creating a proprietary set of digital financial tools, formulating a bespoke full-service offering, building a brick-and-mortar space tailored to the service experience, and launching an advertising campaign. Working in close collaboration with MassMutual, we created the business model and designed the new service down to the smallest detail. We gave the new company its name (after testing more than 700 options). We created a unique corporate identity with a provocative tone of voice unlike any other in financial services today. We even built and tested six full-size, working prototypes. We spearheaded the employee recruiting process. We developed the curriculum. 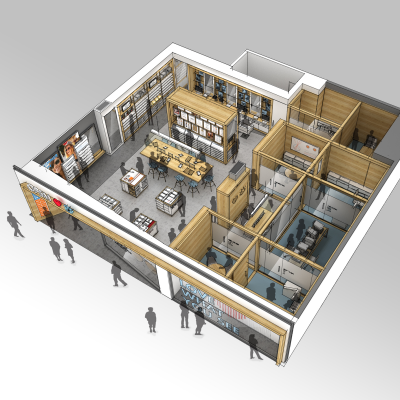 After months of searching, we found the perfect location, designed the layout, oversaw the interior design with the architecture firm, and sourced custom furniture and roughly 100 in-store necessities, from pencils to coffee mugs to signage. It takes a village really, and all of this came together because of a team of local experts/partners. When it came time to launch, we designed a marketing strategy and awareness campaign, which included video spots, print media, posters, and guerrilla tactics. Last but certainly not least, we designed a digital system of financial tools for helping people manage their finances that is more sophisticated, useful, and elegant than anything the financial services industry has ever seen. And throughout the process, we orchestrated workshops with members of our target market to make sure we were doing everything right. The funny thing is, as well planned as everything looks, we almost never got things right the first time. That taught us the value of keeping our minds open to possibilities, which became one of the foundational beliefs of the new company: Success is born out of a willingness to try, fail, and fix. All the designs were based on two years of testing and prototyping with research participants, some of whom joined us at the very beginning and helped shape the experience throughout the entire two-year project. We even conducted six-month longitudinal studies with three couples. Everything was prototyped—we built and tested six separate, live-scale models of the space as well as a handful of pop-up experiences before blowing out three distinct concepts for the new venture. There were wine-and-dine feedback sessions and full-blown dry runs of the Society of Grownups supper club. We sweated over design standards for the space, advertising campaign, and website, and we went through nine different drafts before settling on our bylaws. Society of Grownups serves a vast and largely misunderstood population, and we understood that we all needed to help one another get a little smarter. Society of Grownups is not simply a design solution, but the beginning of a solution to a much larger cultural problem. The name "Society of Grownups" raises eyebrows, which is part of why we liked it—it's provocative and intriguing. MassMutual could have rejected it in favor of something more corporate, but they didn't; they had the foresight to realize that it's more than just a name, it's a mindset. And it has the potential to inspire a movement. The health of the financial services industry depends on an engaged and financially literate population of "grownups," but no one else in the industry was working to educate this audience of 20s, 30s, 40- somethings and develop a relationship of trust in this way – with a rich combination of meaningful in-person exchanges and classes, and a suite of digital, personal financial planning tools unlike anything out there. 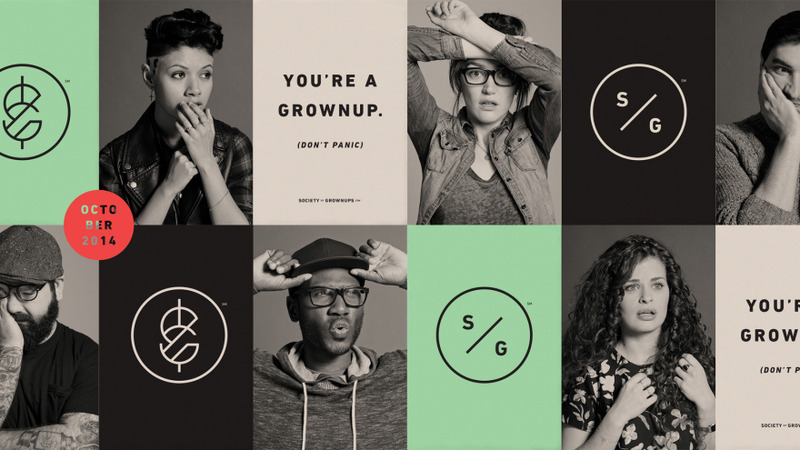 Society of Grownups is a painstakingly researched, prototyped, and tested human-centered solution that can influence a new way of thinking about financial services and lead to positive change. In the current tumultuous economic and cultural climate, it represents a profound step forward. Every touch point was considered and designed with the stakeholders in mind. Not only is this a needed service but also the process went through all the aspects of good service design from designing a brand identity, digital platform, physical location and the teaching content itself. One of the things that was really great to see was that the focus of the work shifted as they gained insight into the new category of looking at how insurance products were sold into the 20s, 30s, and 40s market. And what they realized in doing this research was that it wasn't about trying to inform to sell better but perhaps to solve a more profound problem concerning financial literacy. Seeing a complete delivery of a new concept/new venture that's designed for our time tuning into the nature of the culture as it exists now just shows the power of the human centered design approach to business strategy and to the development of new business models. We were really impressed with the completeness of this work and the rigor they applied to not just the research but the prototyping and also the breadth of consideration of the problem space as well. They basically addressed a cultural problem, unmet needs, completely with the creation of a new venture in its entirety. So they went from coming at it from a service perspective and ended up with a full blown business design in the end. The totality of the project was quite impressive.